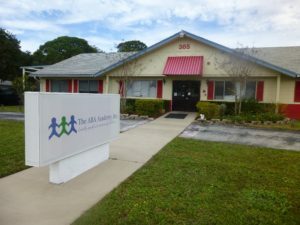 The ABA Academy is a 501(c)3 school started by a few Board Certified Behavior Analysts (BCBA)who knew there was a better way to impact students than what they have seen. They had a belief and a drive to deliver better services and educational experiences for their students and families. Just under 50 students attend classes in The ABA Academy’s color-coded, brightly lit environment. The natural lighting, bright halls, and clean environment are very inviting. Students are placed in one of the six classrooms according to their ages which range from 4 -22 years of age. Depending on the age and ability level the teacher-to-student ratio is between 1:4 and 1:8. All teachers are either certified teachers or certified behavior technicians. I love the seven foundational beliefs that have a prominent place on their website homepage. The first belief and my favorite is “All children are capable of learning.” This is very much what I believe. Finally, I endorse The ABA Academy ‘s transition to year-round schooling. Starting in the 2018-2019 school year, shortened school days will extend throughout the year, including the summer, to avoid the constant loss of information students face over long breaks. The ABA Academy is currently enrolling for the 2018-2019 school year. They accept the McKay, Gardiner, and Step up Scholarships. If you are looking for a different experience for your child, this might be a good fit. Check them out here.